Emulators are prevalent on modern mobile phones, the Android Market loaded with them. Apple rarely supports them officially though, but Hudson is releasing a full-fledged TurboGrafx-16 emulator for free, World Sports Competition being included with the software. Other games will run interested users $3.99, a bit much for most people especially considering ROMs are generally free, legal or not. 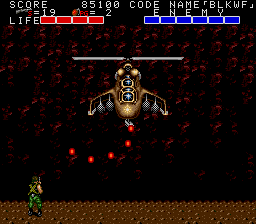 Still, the Turbo has some great ones, including the awesome Ninja Spirit, platform hack ‘n slash Legendary Axe, and military shooter Bloody Wolf. It also hosted a great port of Splatterhouse. However, playing those with the slippery touch screen of a mobile device? That’s not exactly enticing. How Do You Play Marvel Vs. Capcom 2 On iPhone?